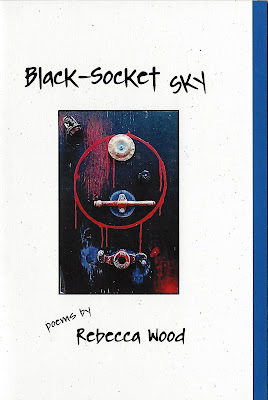 Weather Forecast: Black-Socket Sky by Rebecca Wood! What better way to celebrate the end of 2016 and the beginning of 2017 than with a brand new poetry book? Happy New Year's Eve, indeed! NightBallet Press had heard Toledo poet Rebecca "Becca" Wood read before, but was truly ensnared by this particular collection of poems. When we requested a manuscript from the poet, Becca handed NBP the handful of poems she had just read. Black-Socket Sky is the result. Don't be deceived by the page count of this collection. 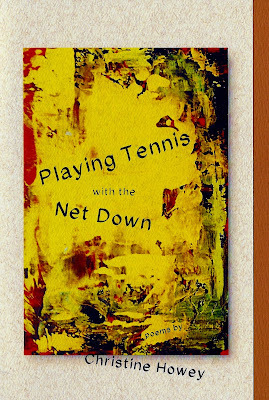 At only 20 pages long and with only 11 poems in the book, it's one of the shortest that NBP has done. But wowza, does it ever pack a punch! Wood explores themes of winter, loss, belonging, religion, and night in a unique voice that rings clear and true throughout. The red, black and blue cover art is a photo of a wonderful piece, "The Shadow a Darkness Makes," by Kevin Eberhardt. Find more of his work at October Conspiracy. Complemented by a royal blue cardstock insert, the cover and inside paper are "themed": the cover cardstock and the paper are matching "snow fleck" design. Rebecca Wood comes from a small tribe of academic gypsies who dragged her around the eastern, southern, and midwestern states until finally coming to rest on the southern shores of Lake Erie in Toledo, Ohio. Her work has been published in In Toledo magazine and the first Broadway Bards Anthology. 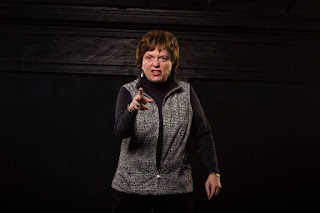 She is an engaging and popular performer, appearing at Artomatic 411, Toledo's 100K Poets for Change, and the Old West End Festival, among others. 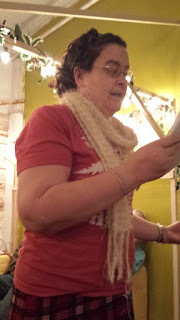 Wood reads regularly with the Broadway Bards, and irregularly at other Toledo venues. At the very special holiday price of $5 postage paid, this book is a steal. Treat yourself to a Black Socket Sky, and soar into 2017...I promise you, you'll be glad you did! 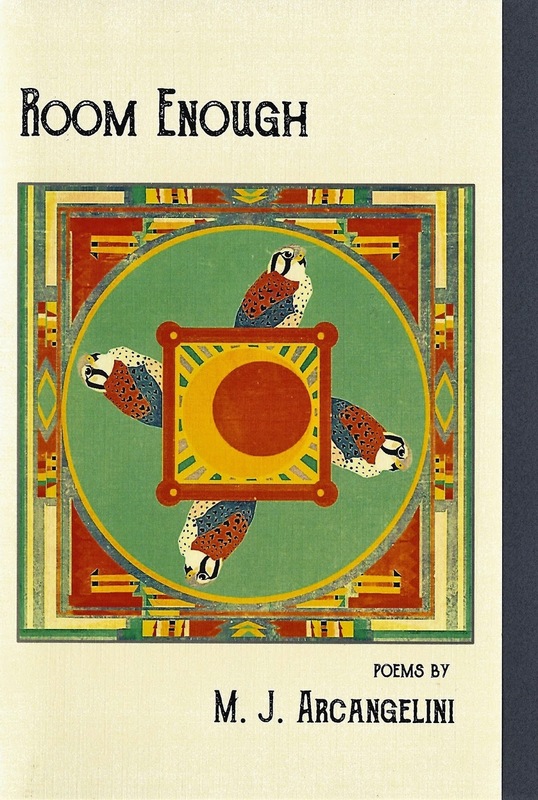 Room Enough poems by M. J. Arcangelini! 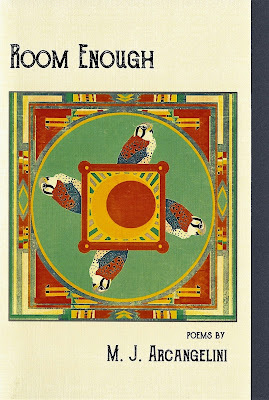 Room Enough is a 44 page book of 26 poems. Both the front cover and the back cover are graced with stunning artwork by Bree. 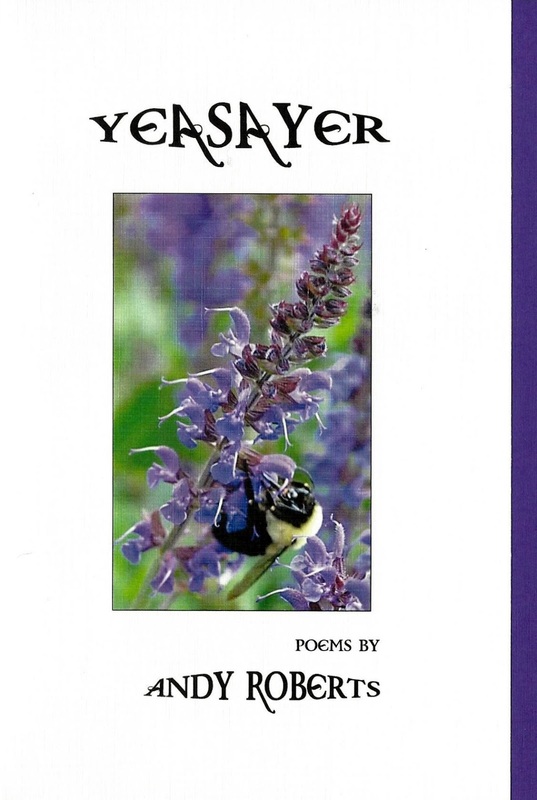 The poems are printed on richly textured ivory paper, matching the textured ivory cardstock of the cover. There's a thick denim-blue cardstock insert. And the poems...ah, what wonderful poems! 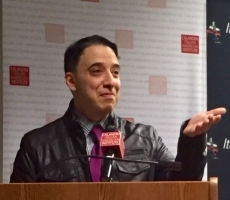 From meeting The Bob Kauffman ("Bob at the Bank") to speaking at International Women's Day ("Written for the Occasion") to having "Room Enough" for the loves in his life, Arcangelini writes with a quiet assurance, with humor, and with heart. say what? i agreed to do what? read poetry at International Women’s Day? what do i know about women? through the rooms of my heart. a room doubled out of itself. Each poem is a gem, polished and clear, shining with truth and sparkling with the soul of the man who wrote it. This is a must-read, can't-put-it-down, treasure-chest collection! M. J. Arcangelini was born in 1952 in western Pennsylvania; he grew up there and in Cleveland, Ohio. He's lived on the west coast since 1973, and currently resides in Sonoma County, California. He began writing poetry at age eleven, stories in his teens, and memoirs in his late forties. His work has been published in nine anthologies, and in many newspapers and small magazines. He is also the author of With Fingers at the Tips of My Words (Beautiful Dreamer Press, 2002, available on Amazon). 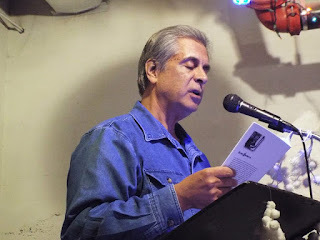 Arcangelini maintains an occasional blog with memoirs and poems at https://joearky.wordpress.com. You may also purchase a copy of Room Enough at the official book release this coming Wednesday evening (August 31, 2016) at Mac's Backs, 1820 Coventry Road, Cleveland Heights , 7pm. The best part of it? 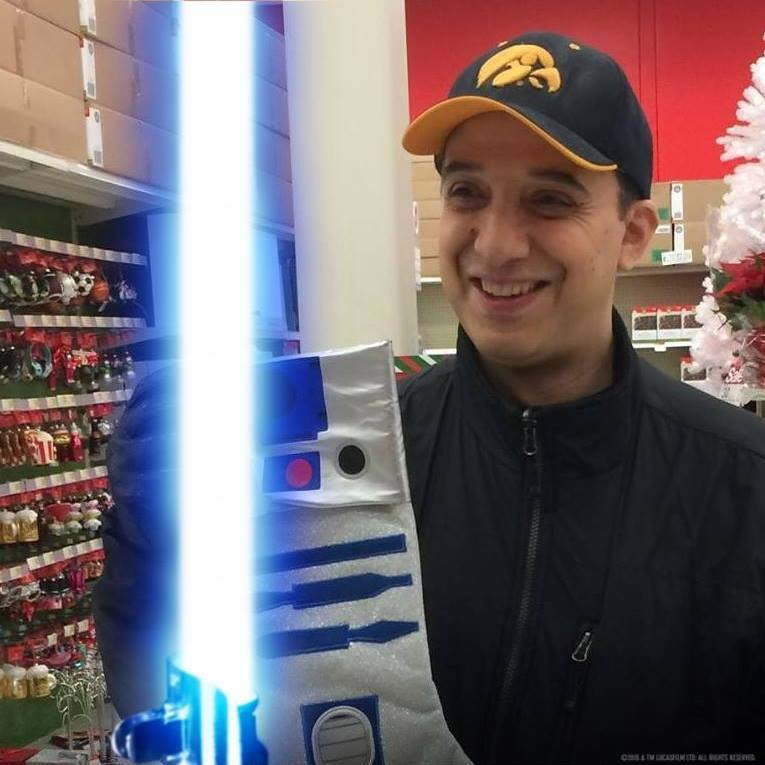 The Man himself, M. J. Arcangelini, will be there to read from his book! I bet if you asked him, he'd sign one for YOU! Please join us there; we'd love to see you! Room Enough rounds out our extended Season 5 at the press, just in time for Season 6 to begin in September. Watch for new books to be published monthly! Nicoletti Burns Buffalo with a Counterfeit Moon! New York poet Joey Nicoletti is about to burn Buffalo with his Counterfeit Moon! And this time, NightBallet Press is going to be right there with him! 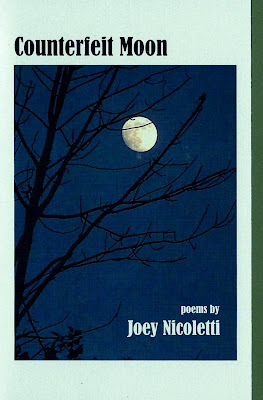 NightBallet Press is enormously pleased to announce its third chapbook title for Joey Nicoletti. Joey Nicoletti is the author of two full-length poetry collections and four chapbooks. A graduate of the Sarah Lawrence College MFA program, he teaches creative writing and literature at SUNY Buffalo State College. Counterfeit Moon contains 18 poems, written only as Nicoletti can write them, with such intriguing and promising titles as "Penne Vodka," "To Donald Trump," "My Mother's Ladle," and "I Just Wasn't Made for These Times." It also contains his Prince tribute poem "A Higher Floor." ("To Donald Trump" and "A Higher Floor" are two of my personal favorites!) The poems are printed on 32 pages of thick, textured white paper to complement the pale mint green cover cardstock and the darker olive green cardstock insert. The gorgeous cover photo was taken by Ohio poet Geoffrey Landis (who, appropriately enough, works at NASA). Nicoletti seizes language, holds it in his teeth, and shakes it until it does exactly what he wants it to! 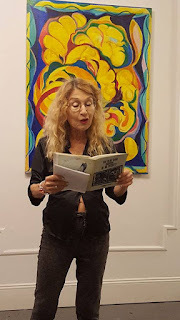 We will be releasing Counterfeit Moon TODAY, Wednesday, July 13, 2016, at Burning Books, 420 Connecticut Street, Buffalo, NY, at the Policies of Truth Poetry Reading, 5 pm to 6:30 pm. Joey Nicoletti will be signing his books after the reading! 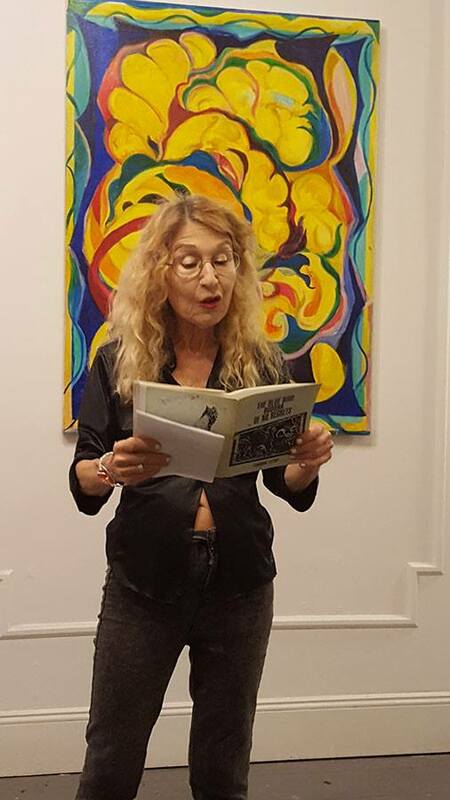 NightBallet Press editor/publisher Dianne Borsenik is honored and excited to be meeting Joey Nicoletti in person for the first time, and to be performing her poetry with Nicoletti, along with road trip partner and NBP poet John Burroughs, and our friend, NY poet George Guida at this reading. It's gonna be a hot time in Buffalo! Come on out and join us, hear Nicoletti read his fantastic poetry, and get him to sign your copy of Counterfeit Moon! For those of you who cannot join us tonight, here's a link to PayPal, where you can obtain your copy for only $5 plus $3 shipping/handling! You don't have to be registered with PayPal to use it; all you need is a debit or credit card. It's easy! Get your copy before they're all gone! It's Time to Get DELIRIOUS! today, on what would have been his 58th birthday (June 07, 2016), with the publication of Delirious: A Poetic Celebration of Prince. 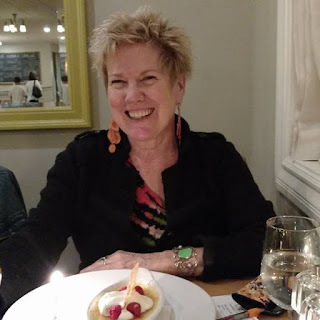 Edited by Dianne Borsenik, Delirious contains 98 pages of poems written by 70 different poets from across the United States, England, and the Philippines. The poems range from a 5-word haiku to a 3-page crown of sonnets; also included are shape-poems, abecedarians, a poem written in java script, a conversation with a 97-year-old mom, poems with lines meant to be sung, a touching tribute to a "best friend," a smile in turquoise, and reminiscences about the soundtracks of younger selves. Each poem is a distinct facet of the glittering world of Prince, his music, his words, his art, his sexuality, his fashion, his convictions, and his impact on an entire generation. Prince influenced lives on multiple levels, giving face and voice to nonconformity and self-expression, encouraging and validating creativity and sensitivity. This book pays homage to the remarkable life of a very special man. It became obvious early on in the call for submissions that we were receiving far more poems than we could accept if we kept the saddle-stapled format NBP has always used. We made the decision to utilize a flat-spine approach for the anthology in order to include as many poems as possible. So, for the first time ever, we sent the book to a printer to have it perfect-bound! Many thanks to all the poets who contributed their work and made Delirious possible. Each contributor who had poems chosen for inclusion receives a free contributor's copy, which will be mailed during the month of June. NBP is truly impressed and delighted by the scope of the work submitted. The gorgeous cover photo is by Cleveland poet John Burroughs, and was taken at the event Pandemonium in Cleveland a couple of years ago. NBP feels it perfectly captures the excitement and sparkle of Prince and the poems that were written for him. It's time to get Delirious! And it couldn't be easier. Just hit the PayPal button to order. You don't have to have an account with PayPal; all you need is a debit or credit card. Order your copy and fill your heart to overflowing with these loving tributes to an unforgettable man...the artist Prince. Please note! This is for shipping inside the United States only. For outside the U. S., please query us at nightballetpress@gmail.com for shipping costs. Thank you! 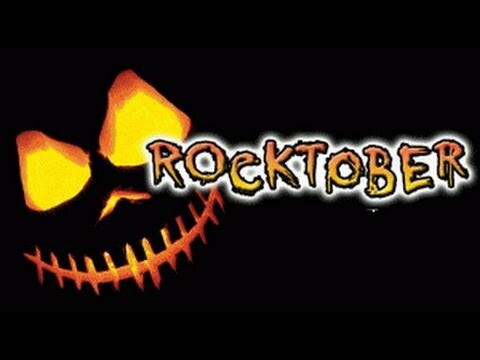 Update 10/09/2018: This title has been SOLD OUT EXCEPT FOR 2 LAST COPIES...don't miss out! Get your copy today on Amazon: Delirious: A Poetic Celebration of Prince. Once these copies are gone, NBP will not be ordering any more. This item is available only through the Amazon link above. THIS JUST IN: George Wallace is Drugged by Hollywood! 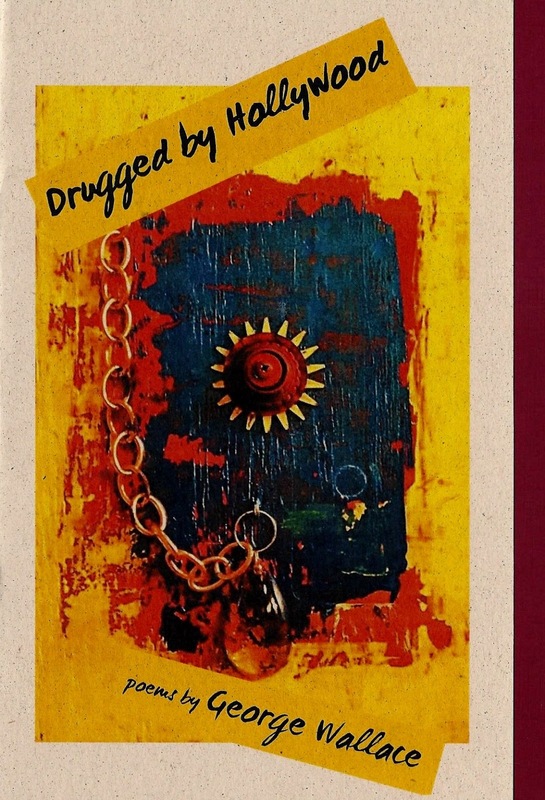 NightBallet Press is excited to announce the publication of a brand new book by George Wallace: Drugged by Hollywood! Drugged by Hollywood is the most recent collection of poems by the prolific George Wallace, a writer and performer living and working in NYC. He is First Poet Laureate of Suffolk County, NY, and Writer in Residence at the Walt Whitman Birthplace in West Hills. The cover cardstock is light brown, with a cranberry red cardstock insert. The wonderful cover photograph is of an art piece titled "Sun Drop" by Ohio poet/artist Kevin Eberhardt. What a treasure this book is, from cover to cover! This is the fifth book that NightBallet Press has done for Wallace, and we are truly honored. 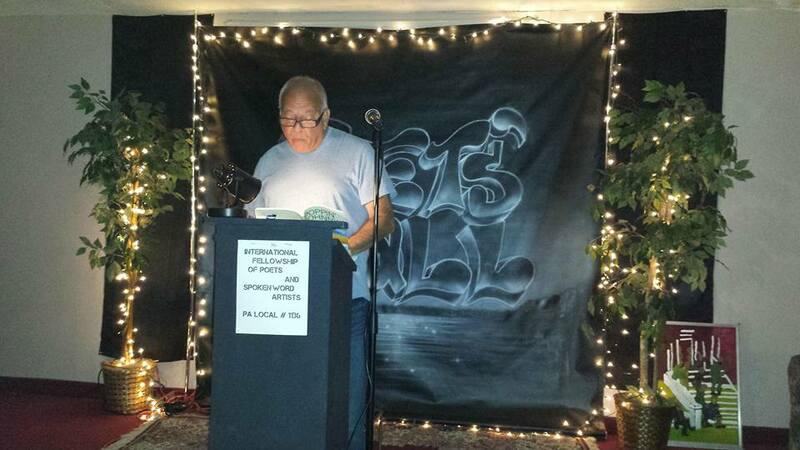 Drugged by Hollywood was released in Erie, Pennsylvania at the Friday, May 20, 2016 Poetry Scene reading with Vincent Quatroche and Dianne Borsenik, emceed by Chuck Joy and Kim Noyes, and hosted by Cee Williams. Wallace gave his usual brilliant performance, reading several poems from his new book. 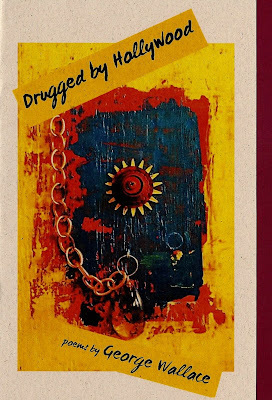 You can get your very own copy of Drugged by Hollywood right here through PayPal, for only $5 plus $3 shipping/handling! You don't have to have a PayPal account to pay, all you need is a credit or debit card. Don't be left out...get your copy today! Buck's Unfinished Litany: Incantations for Transience, from the Cul-de-Sac! NightBallet Press is very pleased to announce the publication of unfinished litany: incantations for transience, from the cul-de-sac by Chansonette Buck! unfinished litany: incantations for transience, from the cul-de-sac is a deeply personal, autobiographical story, told through beautifully crafted narrative poems, of a year colored by cancer. At times, the colors are the darkest indigo, the deepest gray; at others, the colors shine with the warmth of yellows and greens. But through it all, strong spirit and love of life triumphs, as Channie Buck fights to own herself again. unfinished litany: incantations for transience, from the cul-de-sac contains 40 pages of 30 poems, printed on snowy white paper. 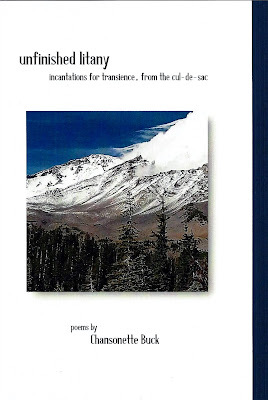 The white textured cardstock cover features a stunning photograph of the poet's spiritual touchstone, Mount Shasta, taken by the poet. The cardstock insert is a deep royal blue, echoing the blue of the sky in the photograph. Together, the colors indicate the turbulent storms of cancer diagnosis and surgery, and the clean, clear acts of survival and triumph. "Chansonette Buck has taken life itself as her subject, its pain and pleasure, darkness and light, failures and successes, and created poetry of impeccable timing, rhythm and grace. She has used the eye and heart of an artist to make the personal into the universal. These poems will stay with you long after the last page is turned. Chansonette has a magnificent gift and a heart generous enough to share it with us. This is essential reading, highly recommended." "Chansonette Buck is observant: searching, reflecting, ultimately allowing her observations to come on their own terms. These are poems of serenity and patience, but they are not without their anguish and regret-the story of a woman grappling with the wounds of former women whose bodies she inhabited but did not carry forward. Her triumph comes in the slowing of time into moments lived deliberately, broken down into still smaller frames that extend what is painfully acute to a more sustained tempo of sounds, time slowed. In subtle beats of living, time becomes the spent petals in the "unfinished world" whose sounds outlast us and whose buds and berries will indeed cycle and ripen-no longer for us, as they have never been for us-and in our own way, we cope with that indifference. At times, we cope with serenity and a calm grace and at times our invocations come as the cautions of the "crawdad cassandra" signaling our own imminent end, and that of the world at large." unfinished litany: incantations for transience, from the cul-de-sac is available for sale, beginning today, May 17, 2016, for only $10 plus $4 shipping/handling. You don't have to be a member of PayPal to use the PayPal button; all you need is a debit or credit card. Order your copy today, and find out what "incantations from the cul-de-sac" Channie performed to be the strong, beautiful, joyful woman she is today! 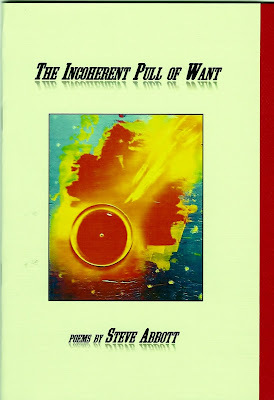 Look out - Steve Abbott has THE INCOHERENT PULL OF WANT! Look out, world! Columbus, Ohio, poet Steve Abbott has The Incoherent Pull of Want...and once you experience it, you'll want it, too! 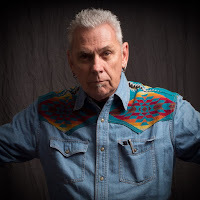 Popular and beloved, Steve Abbott is a founding member in 1984 of The Poetry Forum, now Ohio's longest-running poetry series, for which he continues as co-coordinator. 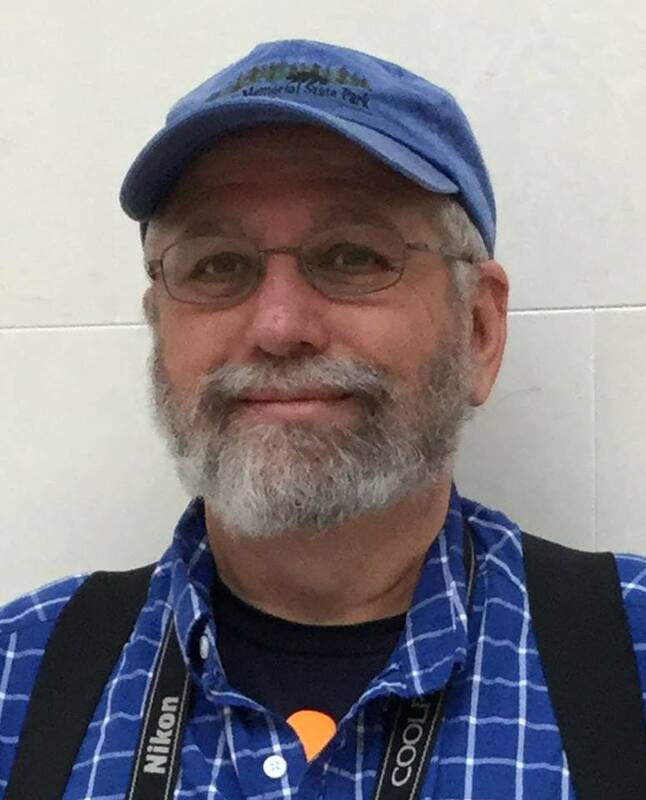 He edits the Ohio Poetry Association's annual journal Common Threads, and in 2015 represented OPA on the Ohio Arts Council panel that selected Ohio's first Poet Laureate. 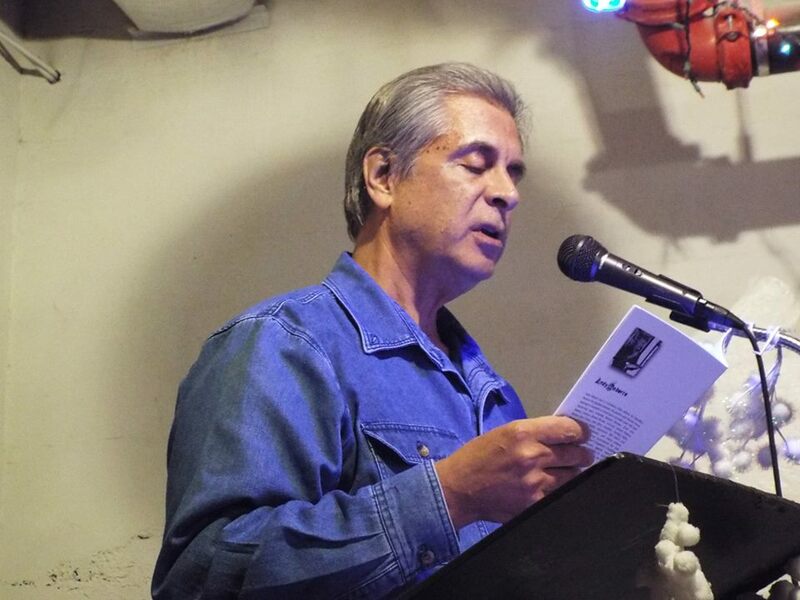 His poetry has appeared in dozens of literary journals as well as several anthologies, and NightBallet was beyond delighted when he sent us his manuscript. Containing such elegantly written (and instantly favorite) poems as "Landscapers" and "When We Sought Justice," this book Is a can't-put-it-down, cover-to-cover-read. 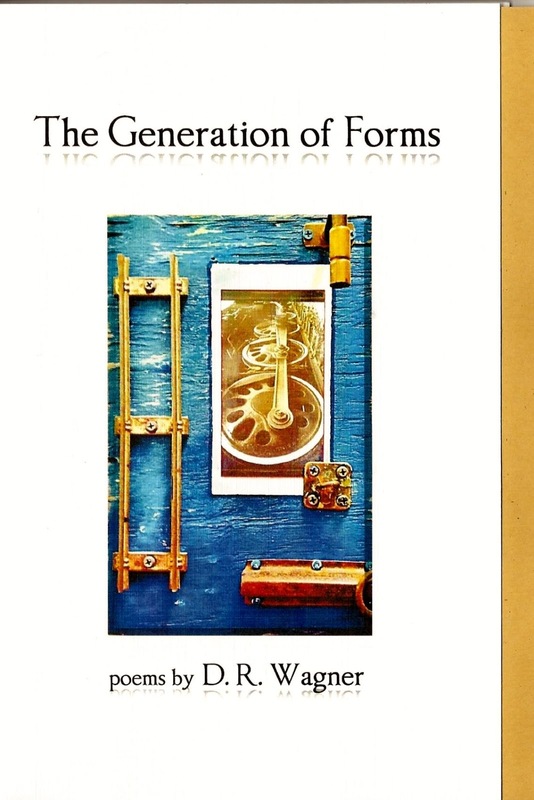 Intriguing titles draw you in: "The Present Doesn't Last as Long as It Used To," "Dead Man at the Centerfold Lounge," "Death Is a Waffle Iron," and "Dorothy's Other Dream." A dynamic reader, Abbott, who is a Distinguished Professor Emeritus in English of Columbus State Community College, received an Ohio Arts Council Excellence Award in Poetry in 1993, and an OAC residency the following year at the Fine Arts Work Center in Provincetown, Massachusetts. He has four previous poetry collections: A Short History of the Word (1996) and Greatest Hits (2004) from Pudding House, and Why Not Be Here Now? (11thour Press, 2016), plus a 2011 live CD recording titled Stardust in Franklin Park. He has edited the anthologies Cap City Poets (Pudding House, 2008), a collection of work by 74 central Ohio poets, and Everything Stops and Listens (OPA Press, 2013), containing work by members of the Ohio Poetry Association. The Incoherent Pull of Want is available beginning today, Friday, April 8, 2016, for only $10 plus $3 shipping/handling. You can get a signed copy from the man himself, Steve Abbott, or you may order through PayPal right here, right now...it's easy! You don't even need to have a PayPal account yourself! You're special and you deserve it, so treat yourself to some mighty fine poetry dining in this banquet of a book! Yea, and Yay, I say...Yeasayer by Andy Roberts! NightBallet Press takes great pleasure in announcing a new chapbook of poems by Columbus, Ohio, area poet Andy Roberts, Yeasayer! This is the third chapbook of poems by Andy Roberts that NBP has published, and there's a reason we keep on keepin' on with his work...we just can't get enough of his mouthwatering poetry! "Yeasayer...is a pensive collection, a philosophical reflection on the questions human beings encounter at we age. Is there any meaning to all this life and living? Have we done alright in the time we have had? Is there comfort and peace waiting for us? 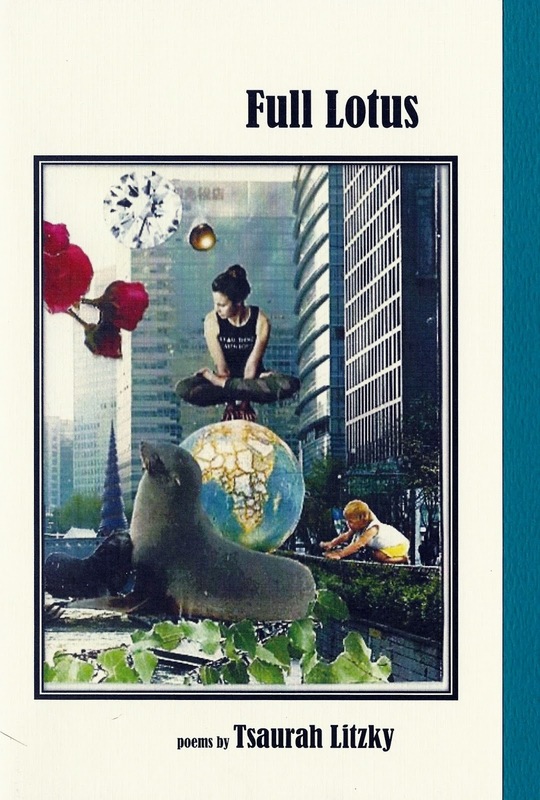 These poems are compact by design, filled with brilliant language and a keen sense of place. Roberts' eye for detail is well-trained and discerning. His grasp of the natural world forms a grounded and credible universe filled with amazement. Roberts seems always to be building a world in which he can feel comfortable and make sense of things as much by instinct as logic. The tone is conversational and the poems are accessible intellectually and emotionally. 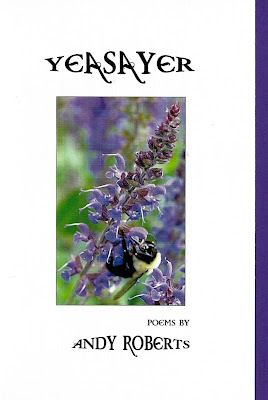 Quiet wisdom flows from these poems; the poet directs us toward understanding and most importantly, a kind of beautiful acceptance, even forgiveness of ourselves for not understanding sooner. 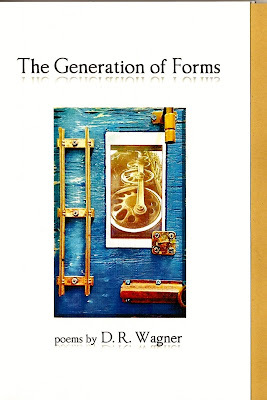 As always, Roberts' strong voice draws us in and holds us gently from beginning to end." and we share the same texture as we age. as we tap into the underground river that flows. as they lose their gold wings to brown. our limbs reaching out to hold the birds. Yeasayer boasts a gorgeous front-cover color photograph by gifted Ohio photographer Chandra Alderman, printed on crisp white linen cardstock. A matching royal-purple inner cardstock complements the photograph. The 24 poems - 32 pages total - are printed on snow-white paper. Yeasayer is available beginning today, March 4, 2016, for only $5 plus $3 shipping/handling. You can order it right here through PayPal with one touch of the button! Get your copy and relax into a world of "Pagan Purples" and "Rain Moving Off" and "Windy & Warm"...just in time for Spring! Andy Roberts lives in Columbus, Ohio, where he handles finances for disabled veterans. 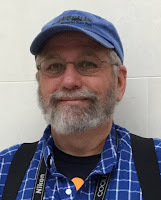 His poems have appeared in a long list of small press and literary journals over the past thirty years, including Albatross, Atlanta Review, Chiron Review, Coal City Review, Fulcrum, Hiram Poetry Review, The Sow's Ear Poetry Review, Plainsongs, and Slipstream. His poetry has been nominated for the Pushcart Prize four times.